It is the responsibility of an emergency vehicle driver to ensure that they refrain from driving recklessly and in an unreasonably dangerous manner. Emergency vehicles have permission to jump traffic signals, drive the wrong way in a traffic lane, speed, and pass other vehicles in ways that would otherwise violate traffic rules. Despite such allowances, it is the responsibility of an emergency vehicle driver to ensure that they refrain from driving recklessly and in an unreasonably dangerous manner. Negligent driving can cause serious accidents and emergency vehicle drivers can be held liable for any injuries caused by negligence. Collisions with other vehicles are the second leading cause of death of fire fighters while on the job. About 31,600 fire truck collisions were reported between 2000 and 2009. Of these collisions, about 70% took place while the fire truck was on an emergency call. 49% of these accidents resulted in at least one fatality. Fire truck roll-over accidents constituted about two-thirds of the total accidents reported. Annually, about 2,600 people are injured in ambulance collisions. 33% of fatalities are reported in ambulance collisions. 35% are either injured or die in ambulance collisions. Out of these, about 4% are the ambulance drivers, 21% are the people transported in the ambulance, 12% were non-occupants of vehicles and 63% were passengers of the colliding vehicle. Police car pursuits cause an estimated 300 fatal accidents each year. About one-third of this number include pedestrians and other individuals not involved in the pursuit. These numbers might not be an accurate estimation of fatal police car crashes and injuries, as the NHTSA recently reported that they were unable to track all police car accidents. The number could be much higher. Filing a claim for compensation for emergency vehicle accidents becomes more complicated than regular vehicle accidents. 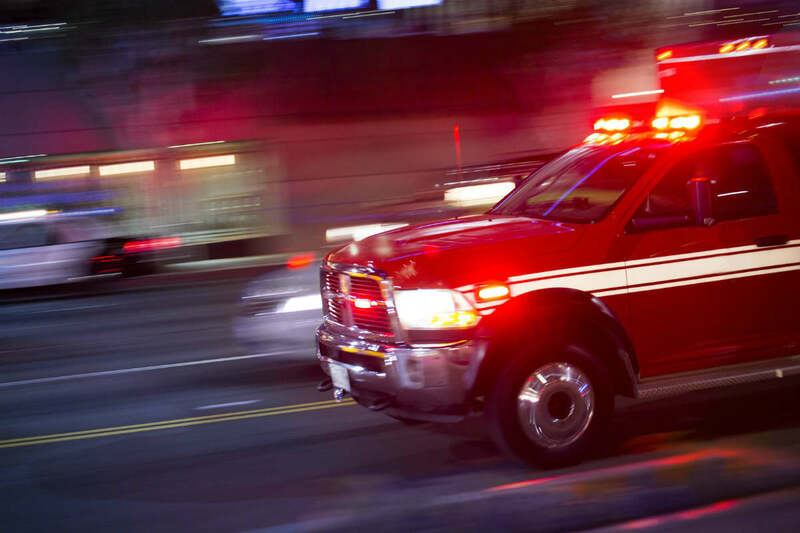 Those injured in an emergency vehicle accident are rightfully entitled to compensation for injuries and damages. If you have been injured in an accident caused by an emergency vehicle, discuss your case with a St. Louis auto wreck attorney. Contact The Hoffmann Law Firm, L.L.C. at (314) 361-4242 for a free consultation.